We’ve been working this year with A-Man a lot on letter recognition. His therapists believe that he is able to read, however he struggles with processing questions. Like, he will randomly tell me what a sign or nametag he’s never seen before says, but if I ask him “what letter/word is that?” he has no idea what I’m asking him. He is also not interested in typical learning activities. 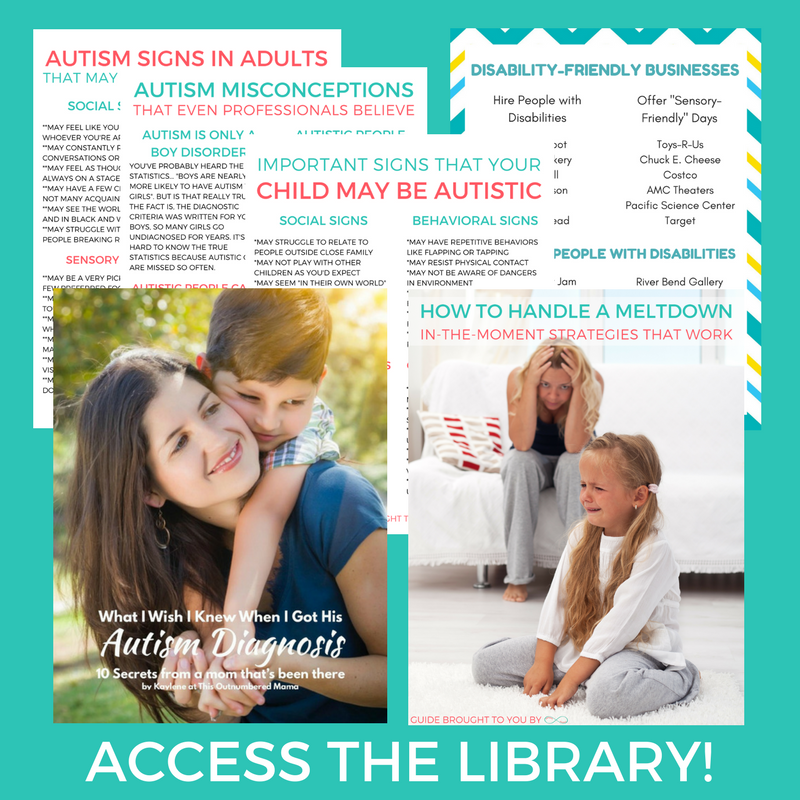 We kind of have to trick him into learning, so we’ve been on a mission to find fun activities that meet his sensory needs and his educational needs at the same time. 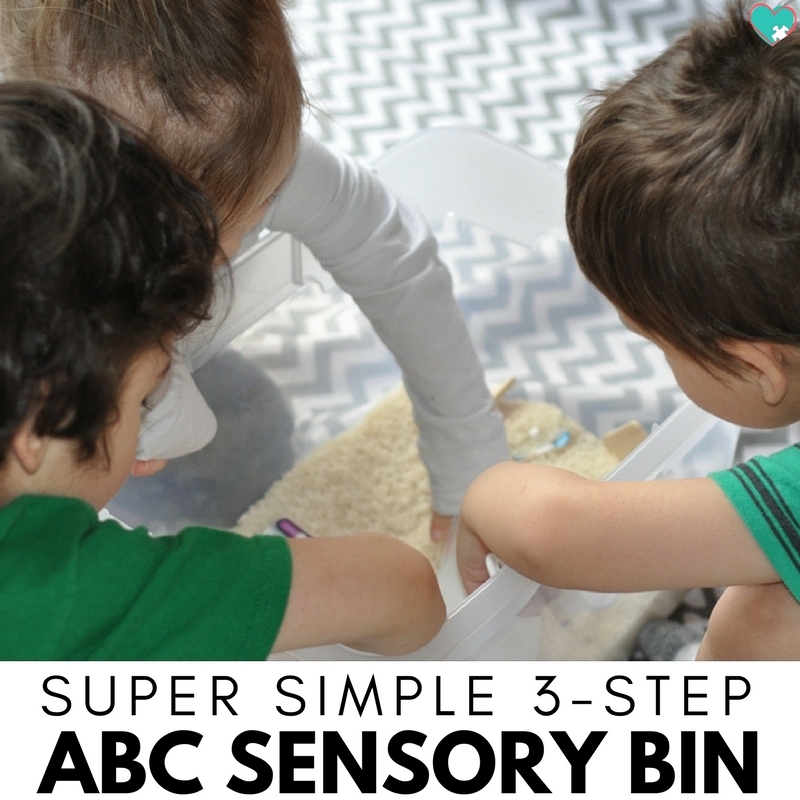 Thankfully we thought of this ridiculously simple 3-step ABC sensory bin! rust me, I am not a Pinterest Mom. 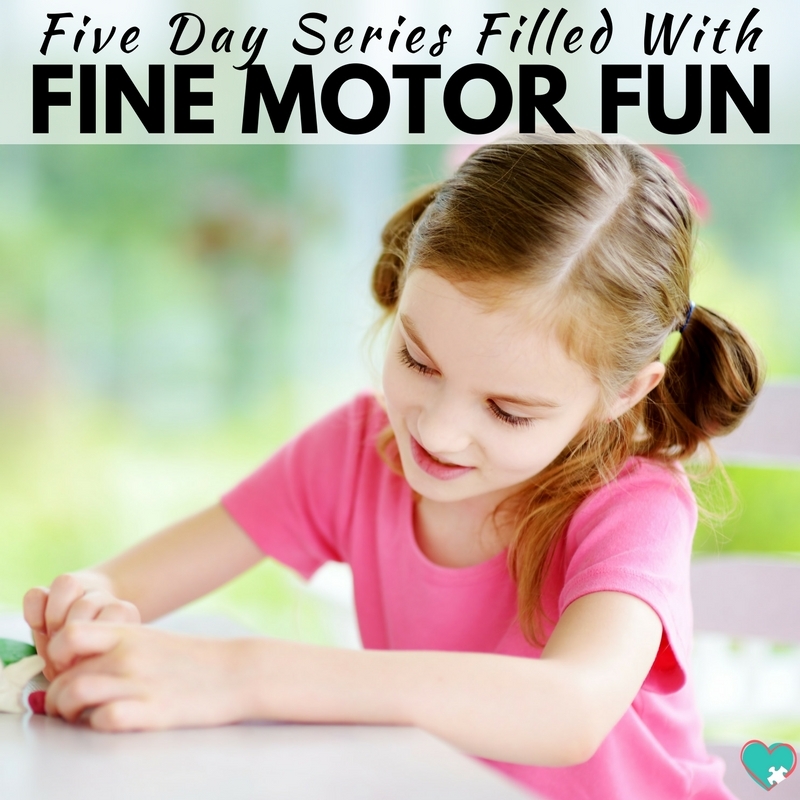 Kids activities have to be quick and simple for me to do them! 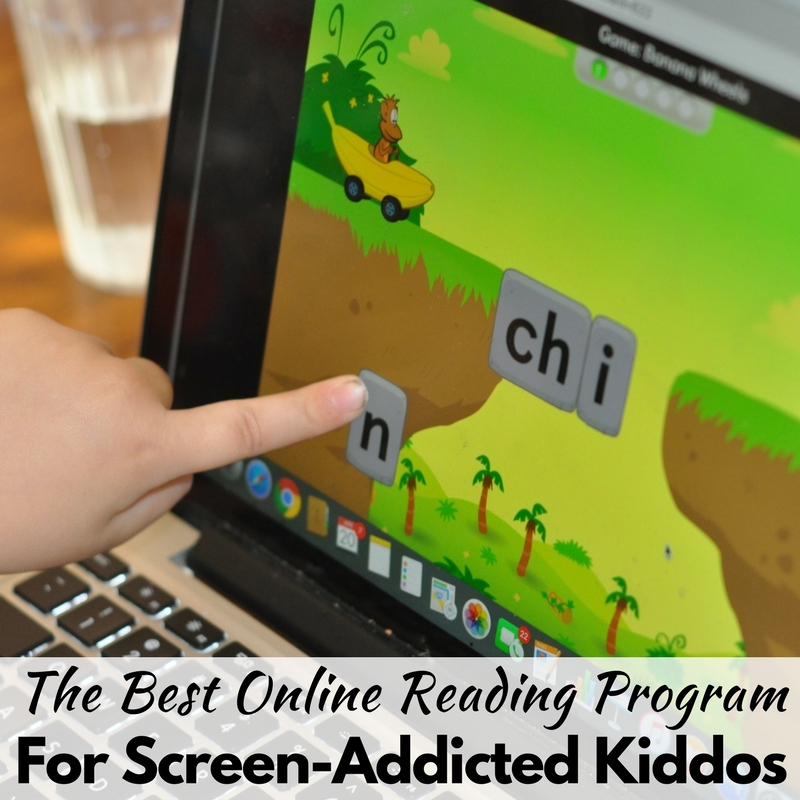 If you have a preschooler trying to learn letters who doesn’t do so well with traditional sit down and practice learning styles, put one of these together and see how it goes! See? I told you this would be easy! This is honestly the easiest part! First, put down a top sheet to help contain the mess a bit. Then take your bin or tub, fill it with the rice, throw in the measuring cups. 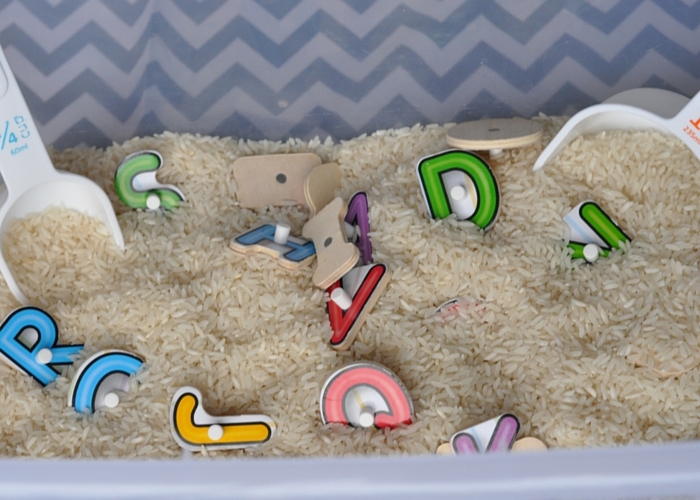 Finally, empty the ABC puzzle pieces to the bin and move the rice around a bit to bury some of the puzzle pieces. It’s as simple as that! All three of my boys loved playing with the ABC sensory bin. Cap’n M was just having fun finding the treasure. A-Man was telling us what letters he found and what colors the letters were. Mr. C even had a blast finding letters to build sight words! After the kids had plenty of fun sensory play, we started putting the puzzle back together. 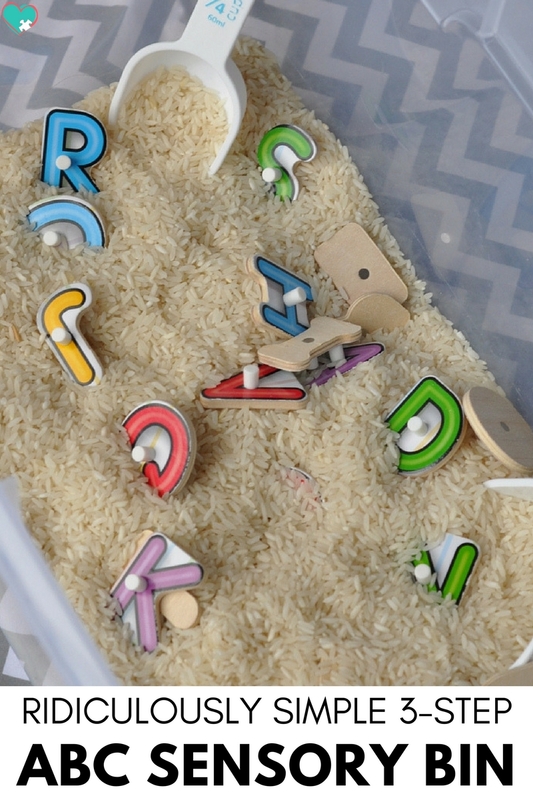 Challenge the kiddos to put the letters into the correct place in the puzzle as they find them. For an added challenge, ask them to find a specific letter. That way they dig through the bin (which gives them plenty of sensory input!) and find the right letter to put in the puzzle. 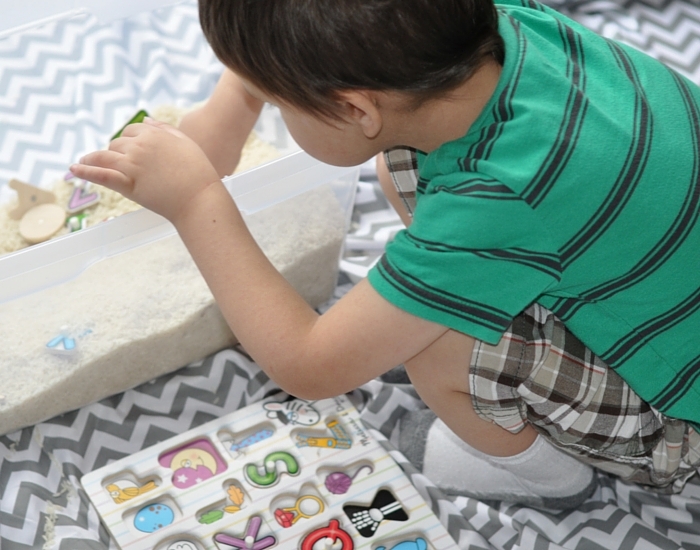 This ABC sensory bin is perfect for preschoolers who are just starting to practice letter recognition. All of my kiddos stayed engaged and learning, and the whole bin took me five minutes to put together! I know this is an activity we’ll be doing again and again as we continue to help A-Man and Cap’n M develop their letter recognition skills! You can also check out more fun ways to learn with puzzles below! You can use alphabet pasta once big letters get too easy!